If your looking for a quiet haven for a peaceful break in the country, The Garden Cottage is just what you are looking for. This little gem is set in the grounds of a large country house, but as it is tucked around the back with it's own private entrance and garden you do not feel overlooked in any way. The cottage has a large bedroom with a king-size bed and walk-in wardrobe, a spacious lounge, which overlooks the lovely garden, a bathroom with shower, and a well-equipped kitchen. Whatever the time of year, The Garden Cottage offers guests a wonderfully relaxing bolt-hole to unwind and relax. Each season comes with it's own charm, in the winter hide away from the elements in the cosy cottage enjoying a glass of wine or playing games in the warmth of the lounge, in spring, walk in the stunning gardens and marvel at the beautiful flowers, which are coming to life, and finally in both the summer and autumn, when the days are the longest and the sun is shining discover the wonders of the ever changing colours of the countryside and the miles of golden beaches on the North Devon coastline. The Garden Cottage is set in the pretty hamlet of Kingscott and near the historical town of Great Torrington, famous for the site of a great Civil War battle between the Roundheads and Cavaliers. The area is blessed with wonderful rolling countryside and is honeycombed with walks and cycle paths, with the famous Tarka Trail starting or ending at the Puffing Billy pub just outside Torrington. There are lots of really good pubs in the area with the New Inn only a short drive away from the cottage and serving award winning food and good local beer. Explore North Devon towns like Bideford, Barnstaple and Ilfracombe or admire the coastal villages of Clovelly, Westward Ho! and Appledore, all offer travellers a taste of the local area. For those seeking an activity holiday, Devon offers something for everyone, with some of the best surfing in the UK at Saunton, Croyde and Woolacombe. Kite surfing is also popular at the beaches on the North coast. The wilds of Exmoor or the coastal footpath offer walks that will challenge the most adventurous and there is great cycling on the Tarka Trail, which stretches from North Devon to Dartmoor. If you would rather have a more relaxed day out, the gardens at RHS Rosemoor are only 2 miles away and have 65 acres of stunning gardens to explore. There are also large country houses to visit at Tapley Park and Arlington Court. So, not only is The Garden Cottage a lovely place to relax and unwind it also offers guests a great base to explore the region. toilet, shower, A good sized bathroom with shower\comma\ WC and wash-basin. The Garden Cottage has a good sized modern bathroom, which is fitted with a wash-basin, a WC and a shower. All the fixtures and fittings are of the highest quality. The Garden Cottage is equipped to a high standard ensuring all its guests have a wonderful time and enjoy a memorable holiday. On arrival guests will find flowers in every room, a bottle of wine and a delicious cream tea ideal for your first evening settling into the cottage. Throughout, the cottage has been tastefully decorated, and all the rooms are bright and spacious. Features within the cottage include WiFi, a flat screen TV, a selection of games and books, an electric oven with four ring hob, a dishwasher, a microwave and a fridge/freezer. Outside, guests can wander the gorgeous gardens, which are home to local birds and wildlife. There is also a nice patio area for alfresco dinners, a BBQ and a pair of sun loungers. The cottage was awesome and had everything you could possibly need. Our favourite bit was the garden and incredible view. Met the owner Sian on arrival and made to feel welcome, Some nice touches that helped us settle in. The accommodation was lovely and bed comfortable. Well equipped kitchen and modern bathroom. The cottage was clean and well maintained. The garden had good views of the surrounding countryside and we saw a lot of wildlife. Really enjoyed our stay and would recommend it to our friends and indeed it was through a friends recommendation that we discovered it. Thank you so much for your kind words and we are so pleased you enjoyed your stay. Look forward to seeing you again! Wonderful setting beside the main character property overlooking garden & countryside. Finished to good spec with attention to tasteful detail. Well equipped. Only the seating needs improvement. Thank you so much for your kind words and we are really pleased that you enjoyed your stay. Thank you also for your comments about the seating arrangements - we will take a look at them through fresh eyes. We were very impressed with the cottage, and its wonderful garden ,and had a very peaceful and relaxing holiday, enjoying the wildlife, and all that the cottage offered us. We had a lovely welcome from one of the owners, with a fresh Devonian cream tea,Cider and fresh eggs, which was a lovely surprise. Thank you so much for your lovely kind and positive words. We are so pleased you enjoyed your week with us, despite the weather, and look forward to seeing you again. My recent stay at the cottage was lovey . On arrival there was home baked scones cream and jam . They even had milk tea coffee sugar and any other basic items you could of needed. We were a few minute car drive to the localshops and pub which did lovely home cooked food... The cottage was small but very clean .. I would definitely recommend this cottage to my friends .. Thank you for your kind words - we're so glad you enjoyed your stay. Superb property with everything you need and lovely views across the countryside, and i would highly recommend this as a place to stay. It is situated in ideal area with many places to visit within a short travelling distance. The owners are lovely people with great hospitality with welcome goodies on arrival. 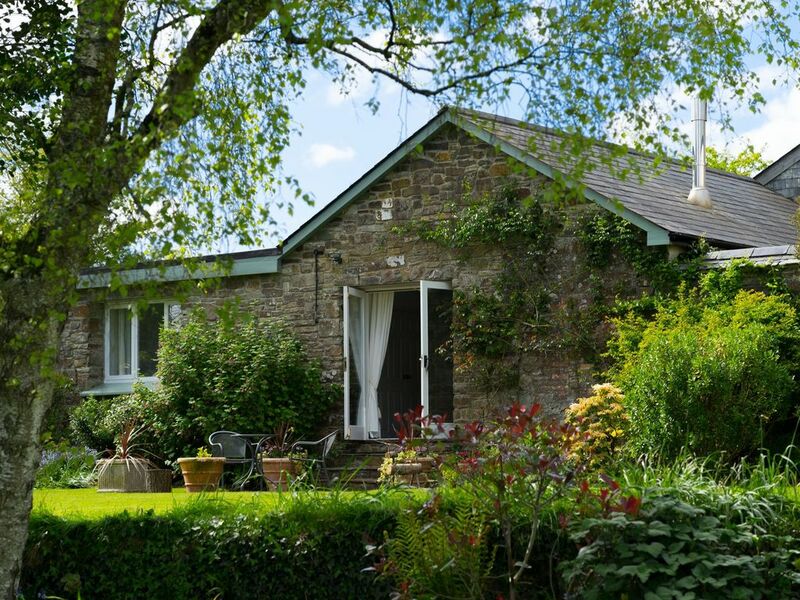 The Garden Cottage is ideally located for exploring North Devon. Nestled in the hamlet of Kingscott on the edge of Torrington it is only a short drive from the cottage to the North or South Devon coast, and either Exmoor or Dartmoor. The two national parks are less than an hours drive from the cottage and provide wonderful days out for walking the beautiful landscape, admiring the stunning views, or stopping off for a traditional cream tea in a cosy tea room. In North Devon visitors can walk the South West Coast Path, which winds its way along the coastline taking in pretty seaside villages such as Appledore and Hartland. The path also climbs to the top of some of the country's tallest cliffs from which you can see for miles. If you are looking to spend the day on the beach, Westward Ho! is less than a 30 minute drive and is perfect for sitting back and relaxing. The village is also home to some lovely restaurants, including The Pier House, and the country's old links course, The Royal North Devon, which has some spectacular views. Within easy reach of Garden Cottage are some great places to enjoy a meal, including the Lymington Arms at Wembworthy, The Duke of York at Iddesleigh and The Masons Arms at Knowstone. Alternatively The New Inn is less than two miles from the cottage and serves good food and local ales.